Still in Bavaria, and more delicious home food…..! 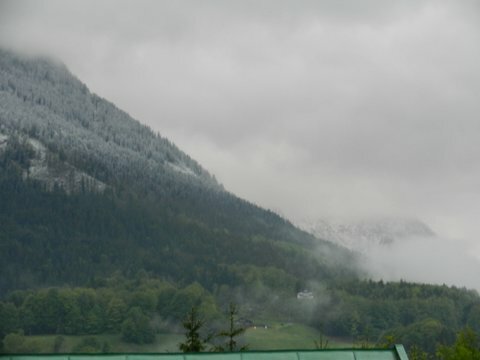 Even though there is still snow in the higher regions of Berchtesgaden (this means it is very pleasant to sit near the fire place at home in the evenings), the valleys are lush green and full of beautiful spring flowers and herbs (most of them edible, by the way). So is our garden here, a rich source of all things delicious and decorative! Just follow the stairs to reach the garden…. 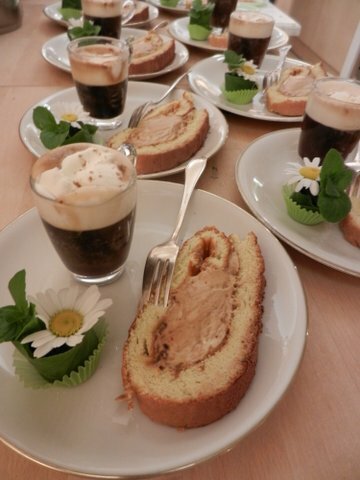 Millet swiss roll with whipped coffee cream. Served with a cute mini flower bouquet (everybody takes home) my mother calls “flower praline”. I have fond memories of this lovely cake. My mother made it for my birthdays when I was a child. Since I live and work in Dubai (a wonderful place too I call my second home), I get one when I visit my Bavarian home. It is a gluten free cake, so delicious and fluffy, and still easy to make, you might want to know the recipe? Preheat the oven at 200 degrees Celsius. Toast the crushed almonds until they are golden. Divide the eggs. Whip the egg whites with a sprinkle of salt; add 50% of the agave syrup and then the egg yolks. Continue to whip until thick foam is achieved. Fold under the millet flour and the almonds and spread on a baking tray with buttered pergament paper. Bake the dough for around 10 minutes. After 10 minutes you need to check: It is ready when the baked dough bounces back on the soft pressure of your fingers. Now dust a large kitchen cloth with millet four. Place the warm dough with the help of the buttered pergament paper it has was baked on upside down on the kitchen cloth. Remove the pergament paper carefully. Roll up the dough with the kitchen cloth and allow it to chill at room temperature. In the meantime whip the cream and add the remaining agave syrup, some orange zest , and the instant coffee powder. Unfold the dough on the kitchen cloth and spread 2/3 of the whipped cofee cream all over. Roll up the covered dough again with the help of the kitchen cloth. Remove the cloth carefully and cover the whole cake with the remaining cream and dust with some cocoa powder. Serve it sliced. Flower pralines are versatile…..and very much in fashion in my mother’s kitchen as you can see. 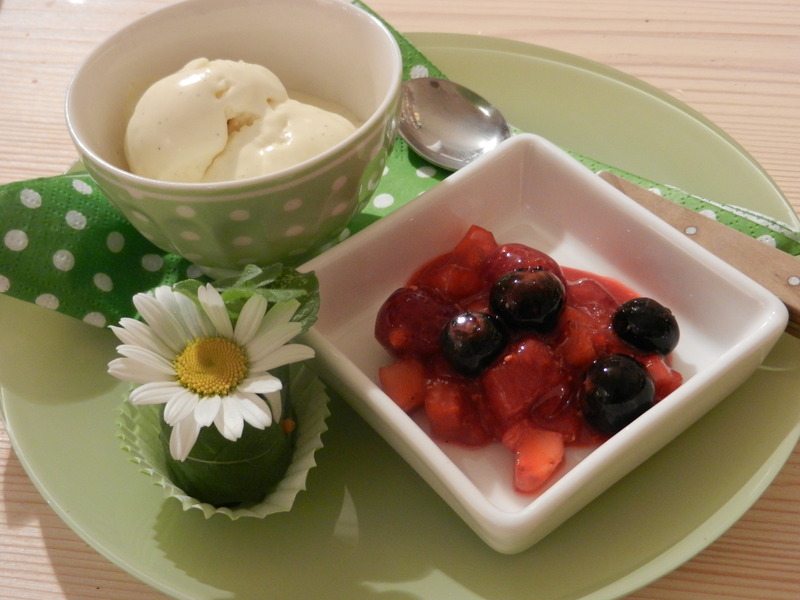 This picture shows her home made vanilla ice cream and berries and – flower praline! Just wrap a flower sponge, which was dipped in water and cut into a small cube with a green leaf, stick in some garden flowers and place in a praline capsule. 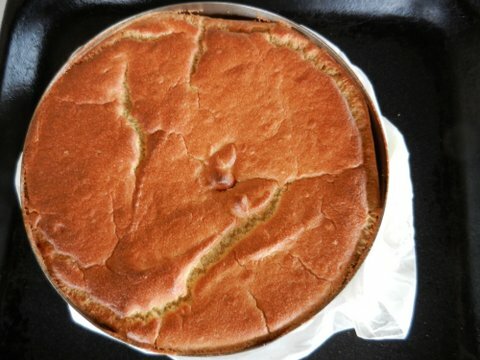 Making cakes with wholesome flour and without white sugar is sometimes a challenge, if you want the dough looking not so rustic…I have discovered that flour made out of millet is a perfect trick to do bright and fluffy sponges. As it is strawberry season now, I have made it with strawberries, but it can be finished with any other seasonal fruits. Preheat the oven at 200 degrees Celsius. Divide the eggs. Whip the egg whites with a sprinkle of salt; add 50% of the agave syrup and then the egg yolks. Continue to whip until thick foam is achieved. Fold under the millet flour and spread on a baking tray with buttered pergament paper. Bake the dough for around 10 minutes. It is ready when a wooden skewer does not carry some of the dough when you stick it into the cake. This is how it looks when it comes straight out of the oven: Now cool down the cake. In the meantime whip the cream and add the remaining agave syrup, some lemon zest and the vanilla. Clean the strawberries and cut them into wedges. Slice the cake into halves. Spread half of the cream between the two halves and sandwich them together. Cover the whole cake with the remaining cream. 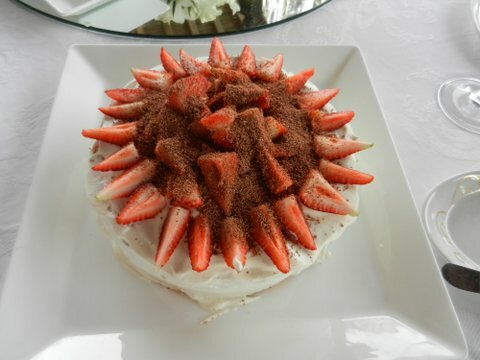 Decorate it with the strawberries and grated chocolate. Have a lovely day and enjoy the cake!